Keen observers will have noticed that the "Recently updated outdoor sites" list at the top right hand corner of this page has disappeared. This is because Blogrolling, the service that I was using to to show the ten most recently updated sites on my blogroll, is no more. To tell the truth it never recovered from being hacked a year or two ago - the rewritten code never functioned as well as the original and in the end the links were just randomised to display any ten whenever the page was loaded or refreshed. I don't want to resort to one those lists of links that stretch endlessly down the page for two reasons. Inevitably a large chunk of them have either not been updated in months or no longer exist, and more than ten links would spoil the page layout. What I want to do is have a list together with a bit of code that displays only the ten with the most recent content. Possibly the sites' RSS feeds would provide the data - but how to use it? Could such a system be powered by Google Reader for example? I don't know. I've had a go at this and got into a bit of a muddle. My motto in life is "If at first you don't succeed - give up", so I'm breaking my own rule by having another crack at it. Any great ideas technowizards? Keep 'em simple - I am a very simple soul, as Miss W will confirm. "The first thing that struck me is that there are very few hostelries on the route..."
"Arbroath should come with a health warning. I finished there one year with X and we were propositioned three times on the walk through the town to the harbour ..."
Sounds like a very fine finish for someone who's been out in the hills for a couple of weeks. And I thought all it would have to offer was a brace of smokies. Challengewise my work is done for now, bar taking a little light exercise between now and May. Not for everyone, though. All over the country, and far flung outposts of the empire world, challengers are fettling their routes. Making sure that they will withstand the attentions of the vetters, who scrutinise each entry with an intense scrute. With a click of the mouse, or the flop of an envelope into the mailbox their brainchilds are dispatched. It's a long, cold winter ahead, and some of us can't get far beyond the end of the drive at the moment - so if you're not poring over maps, wrapping presents or writing cards, how about something to help pass a dark evening? No, not an Arbroath beauty - it's the Doodlecat Cryptic Christmas Crossword. There is a modest prize too (£10 Cotswold Gift Voucher for the first correct answer out of the hat on 7th January). Enjoy the puzzle - and a very happy Christmas to all Doodlecat readers! 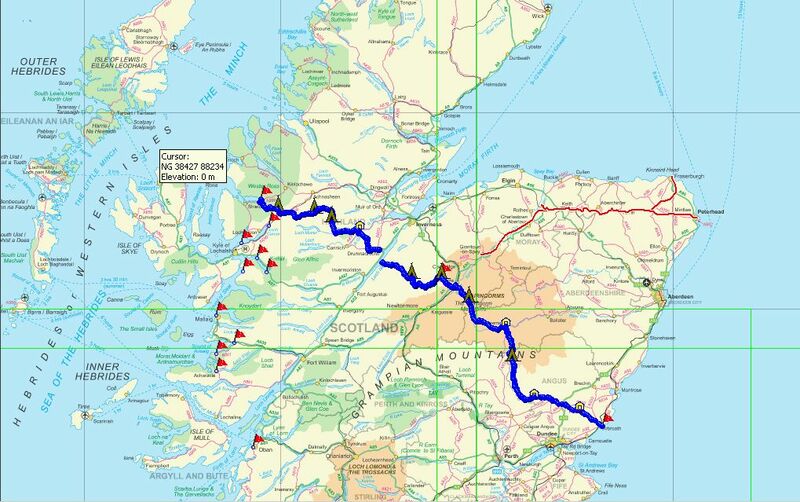 Well, I've done it - my route for the 2011 TGO Challenge has been submitted and I await my vetter's comments. 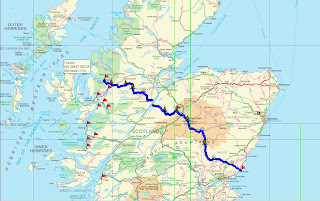 This will be my ninth official challenge walk (I say 'official' because 2001 was truncated owing to the foot & mouth outbreak and although Alan, Mick & I did achieve an entire crossing, we officially signed in at Newtonmore). So Nine it is - that makes this walk quite important to me, as the next, being my tenth, means an automatic acceptance when I next apply. Apparently it also confers upon me the title of "Legend" in Challenge circles, although I hasten to add that plodders such as I are distinguished from the real legends by the careful pronounciation of the term: "Leg - End". I still blame Alan Sloman for all of this (see this post for evidence of his guilt) but at least I have come to understand his evangelism for the event. Now I am guilty of it too. I have already had my brother-in-law cross with me in 2004, and a potential victim for 2012 has already been selected. Time to hone your backpacking skills, Dave! Planning a route is a real part of the pleasure, and a real intellectual challenge too, as you consider distances, ascents, terrain, possible weather conditions and your own mental and physical condition from day to day. It can be very easy, warm and cosy at home, dram in hand, to imagine great deeds done traversing high mountains. At such times it is well to recall being up to your knees in a freezing bog, in pouring rain, utterly tired out and inexplicably 'misplaced'. So the New Years resolution will be the same as always: get out, find a few hills and whip this sorry carcase back into shape.